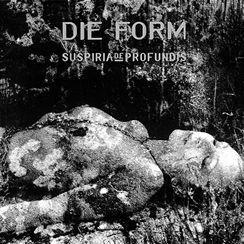 Die Form are Philippe F. and Éliane P.
Cover design and photography : Philippe F.
With SUSPIRIA DE PROFUNDIS (recorded in 1994), DIE FORM emerge themselves deeper into the realm of emotions, of reflections of the soul and of the symbiose of machine and poetry. In this work one can hear the unity of organic and electronic sounds, woven through with beautiful and hypnotical Eliane's female vocals contrasting with the cold machinery. Besides the 13 original remastered tracks, appear 2 additional versions of Poison and Cantique. Very good, new beginning for Die Form back then... More mature, less SM, deeper emotionaly, this album represents the first chapter of "Trilogy Of Passions", a new path for Fichot's experimentalism. More homogenous (but not too repetitive!) structure of the whole album bthen on Confessions brings us to a major turning point in Die Form wonderfull opus.